Visit us for massage and holistic treatments at The Treatment Rooms. Our treatments are truly effective, completely bespoke and set in a historic, relaxing atmosphere. Our range of massage and holistic treatments including Invigorating Deep Tissue, Indian Head Massage and Must-Have Back Massage are personalised for you. We assist you to reduce stress, relieve pain and free up vitality and energy. The Flowing River Relaxing Massage helps you slow down and regain calm; Deep Tissue and Sports massage can help improve flexibility and speed recovery, while Reiki helps bring your mind body and spirit into balance. We even have a Medical Herbalist who will create plant-based remedies specifically for your needs. Your first visit will include a brief consultation with your therapist to establish your priorities and needs. The therapist will communicate with you throughout the treatment to determine effectiveness. Each visit includes personalised aftercare advice. Click here for a map of our location. You will enjoy the quaint coziness of our tucked away courtyard space and the convenience of private parking. 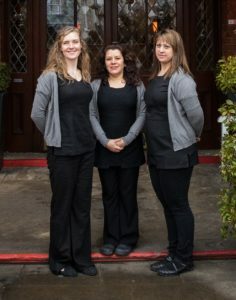 Our on-site massage team is also available to visit offices or events. Our clients come from near and far including Thames Valley villages such as Henley on Thames in Oxfordshire, Reading, Shiplake, Wargrave, and Twyford in Berkshire and Marlow and High Wycombe in Buckinghamshire. Need help choosing your treatment? Ring anytime to speak to one of our talented therapists.